Forming part of the ‘Black and White Village Trail’ on account of the number of half-timbered houses to be found here, Eardisland is a picturesque little village of some 500 residents. Places to stay: Those who like to combine heritage with their accommodation will find the best options in nearby Ledbury. 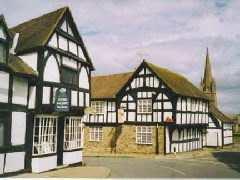 These include The Talbot Hotel which dates from the late 1500’s and is typical of the half-timbered houses which so typify the area. See our specific page for The Talbot at Ledbury. Places to stay: The beautiful Red Lion dates from the early 16th century and offers accommodation within Weobley itself. Meanwhile, Moccas Court (seven miles to the south west) is a lovely Grade-I listed Georgian country house of which independent guest reviews are excellent. Those more keen on self-catering, though, will find some splendid old buildings within Weobley. 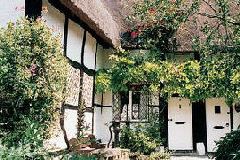 Ella's Cottage, for example, is a classic oak-framed house over 500 years old. Places to stay: Those seeking hotel accommodation are best served by the small towns of Much Wenlock and Church Stretton (hotel and inn options, together with reviews are available courtesy of Booking.com). The nearest inn with rooms, however, is The Feathers at Brockton – a charming piece of old English architecture around ten minutes drive from Cardington towards Much Wenlock. In an area inhabited by man for thousands of years, the origins of this little Peak District village are probably Saxon (the name meaning “Aelfstan’s open land”). Alstonefield has a small but thriving resident community, and is located close to Staffordshire’s border with Derbyshire. Places to stay: Bed & breakfast accommodation is available at Alstonefield Manor (details at TripAdvisor) - a pleasing 16th century house with later Georgian additions. Nearby Stanshope Hall is a fine peak district property dating from the 17th century which also offers bed & breakfast. Also close by is the Manifold Inn which is a traditional coaching inn.age. Places to stay: Crandon House (reviews can be found at TripAdvisor) offers bed & breakfast within the village itself. Alas, we are unaware of any period accommodation in the immediate outlying area. Places to stay: Folly Farm Cottage offers B&B accommodation, while The Howard Arms is the village’s 400-year-old inn. Places to stay: For those requiring historic hotel accommodation then there are a significant number within Stratford upon Avon, many of which are within easy walking distance of Shottery - see our page devoted to historic Alveston Manor, for example. Alternatively, The Legacy Falcon, Mercure Shakespeare Hotel and the renowned Ettington Park Hotel are all close by, too (details and reviews for all can be found at the Stratford upon Avon section of Booking.com). 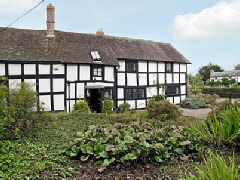 However, there are some fine old cottages available within Shottery, such as Hathaway Hamlet. Places to stay: While there are numerous heritage hotels within Stratford (see Shottery, above), Wilmcote itself offers a notable bed & breakfast in The Old Post House (for details see TripAdvisor).